One of the most biodiverse ecosystems in the world, coral reefs are in serious peril. Coral reefs take up about 1% of the ocean floor but are home to 25% of all ocean species including more than 4,000 species of fish. Coral reefs are colonies of individual animals called polyps. The polyps have tentacles to feed on plankton at night and they play host zooxanthellae—symbiotic algae that live within the coral’s tissues and gives them color. The algae need carbon dioxide and waste products from the coral for photosynthesis. In turn, through photosynthesis the algae nourish the coral with oxygen and organic compounds. The coral uses these compounds to synthesize calcium carbonate (limestone) with which it constructs its skeleton. This skeleton contains bands, like tree rings, that record environmental changes in temperature, water chemistry and water clarity. Coral reefs are also known as the speed bumps of the ocean. These structures act as a natural barrier, helping to slow down and shrink waves hurtling toward the shoreline and thereby protecting coastlines and the 200 million people living along the coasts from hurricanes. We receive many other benefits from coral reefs. Stationary animals, coral are constantly evolving chemical defenses as protection from predators. Scientists are developing new medicines from the coral-produced compounds to help treat cancer, arthritis, bacterial infections, Alzheimer’s disease, heart disease, viruses and many others. Coral reefs also provide us with food and construction materials. They also contribute heavily to the economy via tourism. Why are coral reefs endangered? Believe it or not coral reefs can get stressed out! There are a variety of different factors that contribute to the stress of coral reefs. For example, rising temperatures globally causes coral bleaching. 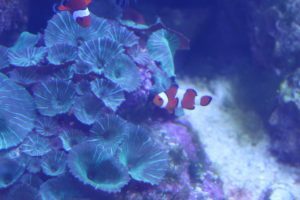 Also, additional carbon dioxide oceans absorb every day contributes to increased acidification which reduces the water’s ability to carry the calcium carbonate that corals need to build skeletons. Additionally, overfishing is changing the coral reefs ecosystem with anchors and nets destroying the natural habitat. And when sediment and other pollutants settle on coral reefs it can speed the growth of damaging algae and lower overall water quality. 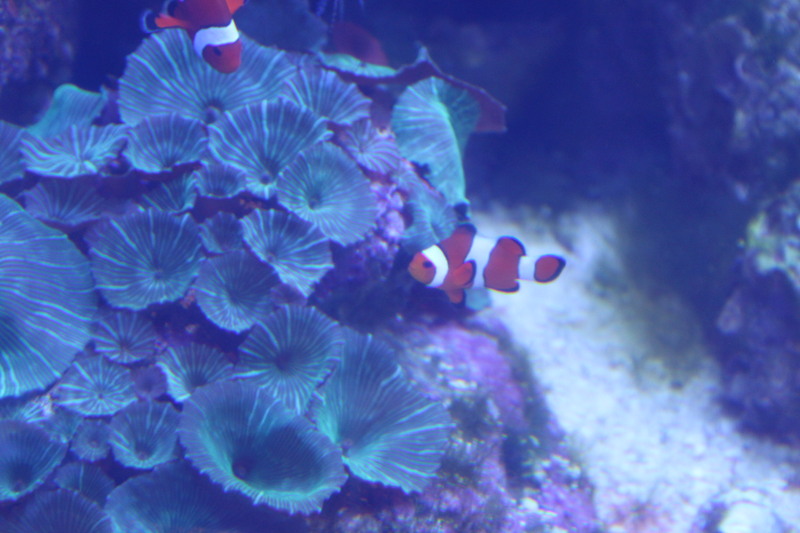 With lower water quality the sunlight may not be strong enough to reach the zooxanthellae to go into photosynthesis. Scientist are working to find some solutions, but all of us can join the effort to help coral reefs by reducing our carbon footprints. Try recycling or using more reusable products. Join the skip-the-straw movement reducing single-use plastic waste. Only eat fish sourced sustainably. Or, donate to organizations and support companies committed to cleaning up our oceans. In 2010, the United Nations recognized the right to safe and clean drinking water as a human right. This means that everyone in the world should have access to safe water for personal use including for drinking, personal sanitation, washing of clothes and food and personal and household cleanliness. In the United States, it is hard to imagine not having access to clean water. In fact, when a community does face a water challenge like in Flint Michigan or the droughts in California, the incidents make big news. Worldwide, however, 2.1 billion people live without safe water at home. And 4 billion people (nearly 2/3 of the world’s population) experience severe water scarcity during at least one month of the year. More than 700 children younger than five die every day from diarrhea linked to unsafe water and poor sanitation. World Water Day was first celebrated in 1993 after the United Nations Conference on Environment and Development recommended an international celebration to focus attention on the importance of freshwater. In 2016, more than 500 events taking place in 1000 countries celebrated World Water Day. At the Aquarium, we obviously support any effort to advocate for clean water. Without clean water, animal life could not thrive. So it was a natural fit when Drink Local Drink Tap invited us to partner for their World Water Day Celebration several years ago. The mission statement for Drink Local Drink Tap reads, “Inspiring individuals to recognize and solve our water issues through creative education, events and providing safe water access to people in need.” Since DLDT’s formation, the organization has provided safe water to 21, 311 people in Uganda and sanitation to 6,994 people, collected 6,255 pounds of trash from Edgewater Park and celebrated World Water Day with 12,679 students through their Wavemaker Program. Arrange for DLDT to come to speak at your school, church, temple, community, etc. Drink Local Drink Tap celebrates all the students who have chosen to be wavemakers each year with a gathering at the Greater Cleveland Aquarium. 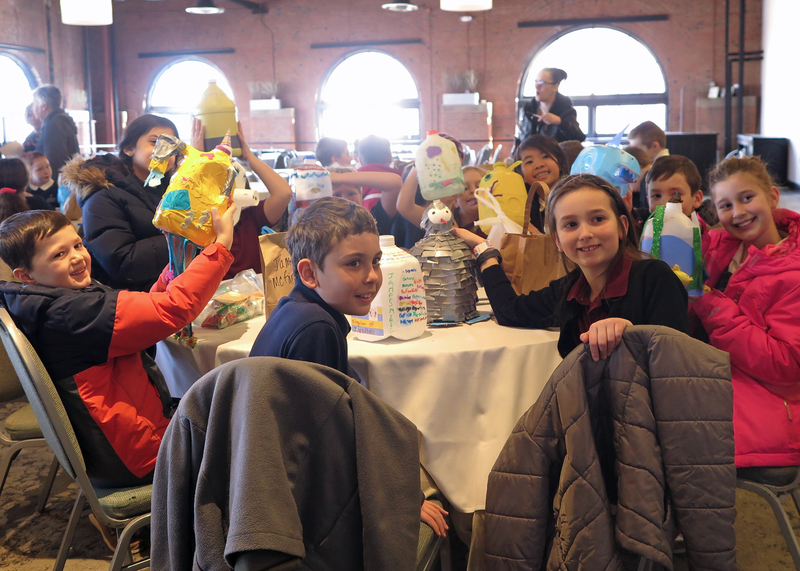 Students have the chance to learn about each other’s projects and to tour the Aquarium, through support from the Northeast Ohio Regional Sewer District. 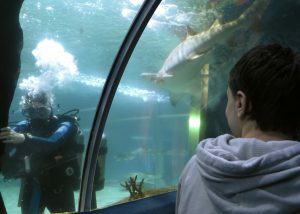 This year, the Aquarium is celebrating World Water Day all weekend long. From Friday March 22 through Sunday March 24, we’ll have a clean water scavenger hunt with the chance to win an annual family pass, and $5 off regular walk-in admission with the code BeATourist19. The first 150 guests on World Water Day (March 22) receive a pin set commemorating the Cuyahoga River, courtesy of Northeast Ohio Regional Sewer District. Come help us celebrate clean water! The Cuyahoga River famously caught fire on June 22, 1969, inspiring several songs and sullying Cleveland’s reputation for generations. But do you know the real history of our beloved river? The Cuyahoga River officially begins about 35 miles east of Cleveland and continues its 85-mile journey south to Akron, where it turns sharply north and flows through the Cuyahoga Valley National Park to Lake Erie. The depth of the river ranges from 3 to 6 ft. except at the last 6 miles, where it is dredged to a depth of 27 feet. Originally the river bed’s last bend took the mouth westward along the lakeshore to W. 54th St., until the present mouth was dug in 1827 to form Whiskey Island and a more direct channel which leads straight into Lake Erie. The Cuyahoga actually caught on fire 13 times. The first fire occurred in 1868, just after the Civil War. The largest fire occurred in 1952, causing more than $1 million damage and the deadliest fire was in 1912, killing five men. The Cuyahoga is not the only river that caught fire in US history. Rivers in Washington, D.C., Omaha, Buffalo, Dearborn and Philadelphia all caught fire as well. By 1968, the reach from Akron to Cleveland was devoid of fish. Mayor Carl Stokes began advocating to clean up the river. 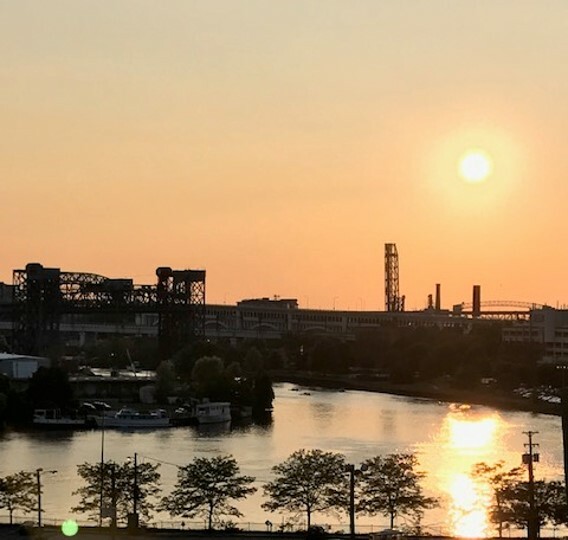 Cleveland voters approved a $100 million bond issue to finance river cleanup efforts, including sewer system improvements, debris removal and stormwater overflow controls. On June 22, 1969, just before Neil Armstrong and Buzz Aldrin land on the moon, the river burned for the last time. The event was not considered “big news” and in fact there are no photos of the actual fire since news media did not make it there fast enough. However, on August 1, 1969, that small fire on the Cuyahoga river captured the attention of Time magazine, which described it as the river that “oozes rather than flows” and in which a person “does not drown but decays”. Inspired by the 1969 river fire, the Time article and other initiatives, Congress passed the National Environment Policy Act (NEPA) which was signed into law on January 1, 1970. This act helped establish the Environmental Protection Agency (EPA). One of the first legislations that the EPA put-forth was the Clean Water Act (1972), which mandated that all rivers throughout the United States be hygienic enough to safely allow mass amounts of swimmers and fish within the water by 1983. The river’s water quality finally began to improve during the following decades, and by the 1980s business investors capitalized on this by converting parts of the Flats’ abandoned industrial landscape into an entertainment district featuring restaurants, nightclubs, and music venues. Recent water tests have found the cleanest river readings in the past 20 years and it is now home to about 60 different species of fish. 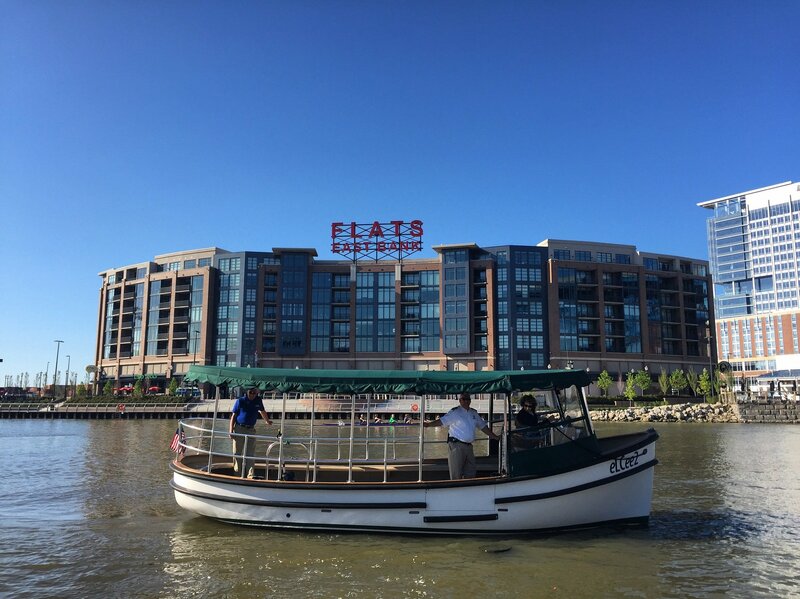 The river continues to serve as the center of an active maritime industry, a growing recreational attraction, the link that connects the cities of Cleveland and Akron, the home of a national park, and the hub of Cleveland’s urban revitalization. It took us about 100 years of fires on the river to finally take action, but once we did, the river reached an acceptable water quality level in less than 50 years. There’s still work to be done, but going from 0 species of fish to 60 species of fish represents great progress. And in the future, our hope is that the burning river will only refer to a really great beer. If you have a group that would like to learn more about a #riverreborn, please contact us to have a speaker make a presentation! It is estimated that more than 8 million tons of plastic trash enter our oceans each year. If that is not shocking enough, this story also hits close to home. According to a study done by the Rochester Institute of Technology, it has been discovered that 5.5 million pounds of plastic goes directly into Lake Erie (Zukowski). This plastic includes visible and micro-plastics which are dangerous to both people and wildlife. The most common plastics found near the shores of Lake Erie include cigarette butts, bags, bottles, caps, straws, and even flip flops. Recycling – It is estimated that 1 trillion plastic bags are thrown away each year, and of the 1 million bottles purchased every minute around the world, less than half of those will be recycled. Recycling those bags and bottles will help cut down on the amount of “new” plastic in circulation. Skipping the Straw – 500 million plastic straws are used each day in the United States. An easy fix to not using a plastic straw is to invest in a reusable stainless steel or glass straw. Furthermore, companies such as Starbucks are starting to get on the no straw trend, as they are now giving a 10 cent discount to customers who bring in a reusable cup. Some stores are also beginning to use paper straws which are less harmful to wildlife and the environment (Nuñez). Keeping Our Coasts Clean – A fun and rewarding way to help cut down on the amount of plastic pollution entering our oceans and lakes is by volunteering for a beach clean up. The Greater Cleveland Aquarium’s Splash Fund organizes Adopt-A-Beach cleanups with the Alliance for the Great Lakes every summer. To register for our beach cleanups, please visit greatlakesadopt.org. You can find the Aquarium hosted cleanups by searching the date of the event, the location (Lakefront Reservation – Edgewater), or both. Then click on the event and follow the steps to register. Registration is important because it gives us an idea of how many people to expect and also provides contact information so that we can keep everyone up to date on details or changes (i.e. the weather does not cooperate). We hope to see you there! Cuyahoga means “crooked river,” for good reason; it kind of looks like a backwards letter “U.” The river begins with two separate branches in Geauga County which join and flow south through the city of Akron. The river then comes back north to Cleveland and empties out in Lake Erie. Throughout the 1800s, Ohio grew. The Ohio and Erie Canal gave local businesses and farms access to resources. That connectivity meant Ohio’s farmers could sell their goods for higher prices in a more competitive market. But as industry and population grew there were some consequences. The Cuyahoga River suffered. Minimal laws for waste regulation combined with chemical and steel materials dumped into the river – the Cuyahoga caught on fire not once or twice, but thirteen times. The most famous fire, in 1969, gained national attention and began an environmental movement that sparked initiatives such as the Clean Water Act of 1972 and the formation of the Environmental Protection Agency. The Cuyahoga began to clear. Through its Rivers & Lakes: Keeping the Great Lakes and our Water Quality Scientist programs, the Aquarium brings students to the River’s banks to test its water quality the day of their visit. Using the scientific method, students determine if the water is excellent, good, fair or poor. These tests take temperature as well as pH and nitrate levels into account. Students then discuss why it is important to test for these particular things and what variables can change the result. For example, oxygen levels can drop if the water is stagnant, phosphate levels will spike if farm fertilizer runoff enters the water and nitrate levels rise whenever human sewage is dumped in the river from sewer overflow points. According to our Erin Bauer, Greater Cleveland Aquarium’s Education Coordinator, most days the Cuyahoga’s health comes out “fairly good,” but says there’s always room for improvement. Students tend to have a range of reactions to being out by the river. Bauer states, “Getting to throw a water sample collection bucket into the river is always a highlight. Hearing kids make observations about what they see is always great. There are always a few ‘Eww, the brown water is nasty!’ and ‘Look at those plastic bottles out there.’ But there are also observations like ‘Cool! Look at those sea gulls!’ or ‘Wow, it’s bigger than I thought!’” Bauer is particularly happy when a barge passes by and the students can see how the river contributes to the region’s transportation needs. The program has help from Northeast Ohio Regional Sewer District (NEORSD) which provides the tubes and tablets needed to test water quality. They also gifted us an enviroscape model that illustrates waste water treatment, drinking water treatment, runoff in the watershed and combined sewers. Visiting students are asked to brainstorm ways they can make a positive environmental difference for the Cuyahoga River. For example, buying organic produce can reduce phosphate levels, planting trees can decrease turbidity, and reducing water volume while showering or brushing teeth ultimately leads to a decrease in sewer overflow. If you visit on November 15, you can join us in celebrating America Recycles Day! Although we’ll be highlighting the benefits of recycling on Wednesday, throughout the year we’ve been trying to reduce, reuse and recycle more. Did you know that more than 8 million tons of plastic is dumped into our oceans every year? That’s not good for us or for our aquatic friends. Based on waste audits done by the Aquarium’s Green Team we estimate that by the end of this year we will have kept 2700 pounds of plastic out of landfills. Making recycling simple and convenient for your family makes it more likely they’ll participate. Try designating a bin in each living area that generates waste (kitchen, laundry room and bathroom). Then, label the containers with signs that list what is acceptable so no one puts an item that doesn’t belong. 1. You can learn how to test the Cuyahoga River’s water quality using kits provided by Northeast Ohio Regional Sewer District. 2. You can enjoy a packed lunch at our waterfront picnic tables—front row seats to watch an array of interesting boats pass by. 3. You can challenge your friends and family to a game of fish corn hole before taking a commemorative pre-framed photo with a bridge view. 5. Did I mention the River Hut is right on the boardwalk? Thanks to ArcelorMittal, this summer you can hop back and forth between the East and West banks of the Flats on the Metroparks Water Taxi for free! Weather permitting, the River Hut is open 10am – 4pm on Saturday and Sunday through Labor Day. Imagine living in a beautiful, underwater world where there’s nothing but the rays of the sun and your fellow aquatic friends surrounding you. Then the next thing you know, you’re surrounded by a sea of… what’s that? Pollution. Trash floating everywhere. There’s nothing more alarming to marine life than being caught in a fishing net or consuming litter that is extremely harmful to the animal’s life. To get a glimpse of how harmful pollution can be for the animals, here are some alarming statistics. Plastic takes about 400 years to degrade in the water. Remember that favorite can of soda you love drinking? Well that takes about 200 years to degrade in the ocean. In the meantime, the pollution just hangs around, harming any animal in its way. According to Plastic Oceans, “1 in 3 species of all marine mammals have been found entangled in marine litter.” As tourists and even local people, we have to be more mindful of our actions and what we can do to protect our oceans. Another dangerous effect of trash floating and sinking in the ocean are the chemicals that the pollution can emit. Fish and other animals will consume these chemicals, potentially killing them and even causing negative side effects to humans. How you ask? The fish consume the marine litter. We catch the fish and then we eat the fish. Now we have the same chemicals in our body that make us sick. The thing is, the animals don’t know what they’re about to be tangled in or consume. We know exactly what we’re putting into the ocean, but also may not realize the effects it has on our aquatic friends. So what can you do to help revive our oceans and save our underwater world? We as humans and ocean lovers need to be more conscious of pollution in the ocean and on the beaches. By picking up all of your trash, you’re reducing the chance of the waves snatching it during high tide and being carried into the ocean. If you see trash laying on the beach or in the ocean, don’t be afraid to grab it and throw it away or recycle it. Even the most simple act of picking up one water bottle can lead to a whole movement of reduced pollution and one more sea creature living a longer life. No matter who or how old you are, you can make a difference in protecting marine life making our oceans a cleaner and safer place. Springtime, for many people, intuitively brings an awareness of renewal and life. The trees flower, the insects emerge, and of course baby wildlife is a wondrous sight. What can equal the rapture upon observing a baby deer take its first steps or a little bird learning to fly? People may come across baby animals in their backyards while clearing brush from last fall, when they begin to mow their lawns, or trimming trees and bushes. Sometimes, accidents happen and can leave wildlife injured or orphaned. Often, these people then want to then care for the animals and raise them. Although the intention is well-placed, most people do not have the information or resources to accomplish this properly and for the optimal health of the animals. This is where wildlife rehabilitators come in. A wildlife rehabilitator is a person who has acquired the knowledge and permits, and understands the commitment involved in caring for an orphaned or injured animal. In Ohio, it is actually illegal to rear wildlife without a permit. This is for the protection of not only the wildlife, but also the people who wish to help. Wildlife can carry bacteria and viruses that are harmful to people; these types of illnesses are called zoonotic diseases. The wildlife rehabilitator would have gone through training to be able to identify the symptoms of such diseases and can take measures to protect oneself and provide the proper care for the animal. Further, baby animals require highly specific diets vital to their growth and development. Cow’s milk from the store is not even a close substitute for most of the wildlife a person would come across. Just imagine the tiny bones of a squirrel and the functionality they provide that animal when dashing through the trees. The ingredients in cow milk are simply not suited for helping form those little skeletons. Likewise, feeding worms to a baby bird whose diet should consist of mostly seed is not only detrimental to its growth, but often fatal. An animal that is fed the wrong diet will quite frankly starve to death because it is not getting the nutrients required for its species. Wildlife rehabilitators have the permits, education, and experience to provide the proper care for an animal that needs help. Conversely, many times a baby animal is found, it is not in need of human assistance. Many times the animal is healthy, but the parents are away finding food or deterring predators. No person educated or otherwise can provide the equivalent care that a mother can. It is always best to try to reunite with the parents before attempting to bring that animal into a captive environment. If the animal is injured or the parents are known to be dead, that of course would invite human help. When capturing an animal in need of assistance, personal safety should always be the priority. Animal will bite, no matter how cute they appear. Once the animal is captured, it should be placed in a dark, quiet place until it can be transported to the nearest wildlife rehabilitator, which should happen as soon as possible. The animal should not receive any food or water! Depending on the animal and what circumstances led to the need for assistance, this can be dangerous. An animal whose body temperature has dropped below normal, for example, can die if given food or water to try to digest in addition to trying to bring its temperature back up. This simply places too much stress on the body and it will shut down. The animal must be taken to the nearest wildlife rehabilitator as soon as possible to legally receive the proper diet and medical care. Why would the Greater Cleveland Aquarium, which has fish, care about local wildlife, you may ask. 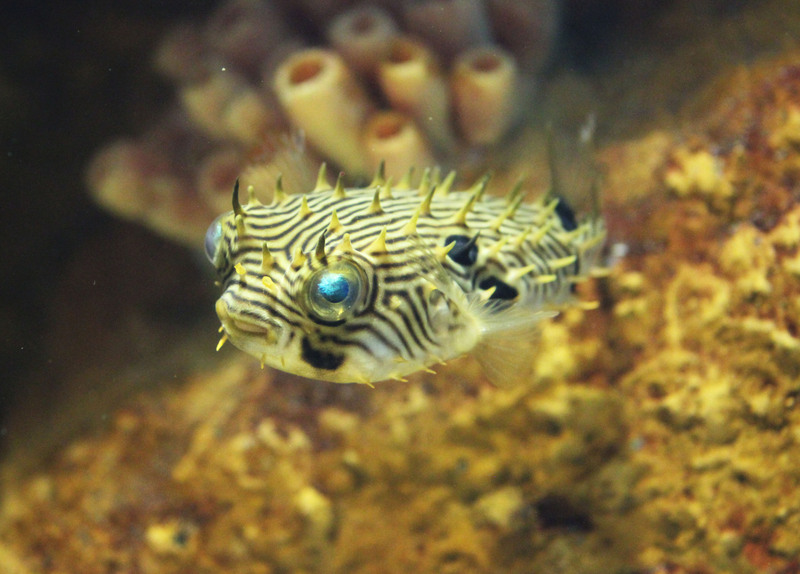 The Greater Cleveland Aquarium, as a conservation organization, takes an interest in this topic because it is a conservation and stewardship issue. GCA has some animals in its care that were rescues and required a permanent home. We strive to provide the best care for the animals for which we are responsible, and wish to see the same for any species. Remember to find a licensed wildlife rehabilitator if you come across an animal in need. Please do not attempt to raise the animal on your own. It is difficult, not to mention illegal, to do so.